What to consider when selecting your Outdoor Kitchen Sink? There is really not much difference between indoor and outdoor sinks; both function the same way and are mostly made of the same materials i.e. stainless steel. What makes them different is how they are treated and the environment they face. Outdoor sinks may also be a bit pricier because of the plumbing system, especially if it is non-existent outdoors. Prices also tend to increase when you pick the thicker materials for your outdoor sink; one that can withstand the changing weathers. Keep in mind that thicker and higher quality steel will last longer and perform better. Indoor and outdoor sinks may function the same way but you will want something that will last amid risks of corrosion and staining. To give you an idea of what to consider when selecting your outdoor kitchen sink, we have rounded the factors that may help you in picking the right one for your outdoor kitchen. What are the factors to consider when getting an outdoor sink? Material – Although stainless steel is the popular bet of many homeowners because of its endurance and longevity, some choose to go out of this comfort zone to try other ones, mostly for the sake of look and appeal. They pick the fancy ones like a hand-hammered copper and ceramic. These types of materials can be presented in a glitzy manner, with carvings and designs that really make the sink pop in the kitchen. For some that choose usefulness over looks, their choice is the stainless steel. Thickness – Price increases as the material goes thicker. When it comes to steel, such as the stainless, the lower the gauge, the more substantial the metal. However, like the fancy copper and ceramic, thicker metal is more or less a matter of cosmetic rather than function. Size and Style – The size and the style depend on the design of the outdoor kitchen and how much space you are going to allot for your sink. Some examples of styles are Undermount (installed below the counter), Drop-In (fitted on the counter), Rectangle (the traditional sink), and Double (features double bowls fitted together). Undermount allows for more space for food prep compared to the drop-in. This is because the edges of the drop in are extended on the counter. Shapes to choose from include zero radius (undermount), round, oval, square, and the traditional rectangle. Price – To give you an idea of how much sinks cost, we have listed below sample products and their corresponding prices. 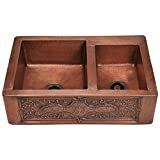 SUPERIOR CRAFTSMANSHIP: This innovative 32" handmade undermount sink has fully undercoated walls with a unique sound-eliminating technology. A rubber composite is coated on the exterior of the sink preventing condensation. Enduring stainless steel composition ensures resistance to superficial damage like dents or scratches and is guaranteed not to rust. MODERN APPEAL: This stainless steel kitchen sink is a modern take on the concept of the traditional farmhouse design. Constructed wholly of premium 304 Series stainless steel with a commercial-grade premium satin finish that's smooth to the touch. SPACE: A deep sink basin creates additional room to fit large pots and pans. This sink is designed to maximize standard sink usability. The combination of optimal space and durability allow for a variety usage purposes. Constructed of KOHLER Cast Iron. Installation – Buying the sink itself may not necessarily be the most expensive part of the sink; it is actually the installation and tying it into your home’s plumbing system. Hot and cold water lines must be run from the house and should be thoroughly insulated to protect it from the winter weathers that may cause freezing. Same thing for the drainage; it must be routed to the wastewater system. Prices vary depending on the distance of the sink to the house, and likewise, the distance to the sewer system. Prepare at least $1,000 to pay your plumber. Maintenance – Since your sink is installed outdoors, typically, it requires much more cleaning and maintenance compared to its indoor counterpart. Stainless can discolor if debris is left behind. This is the same for copper and ceramic, which can stain and sustain dirt if not properly covered. A good cover doesn’t cost much but it will protect the sink from rain, snow, and dirt. It is also recommended to shut off the water supply and drain the lines during winter months to prevent freezing and bursting of pipes. Faucets – Just like your careful selection of sinks, you should also consider getting a faucet that can withstand being exposed under the changing climate. 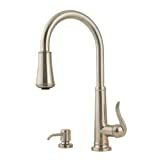 Look for faucets made of solid brass instead of plastic or chromed metal. Product complies with NSF/ANSI 372 and conforms with lead content requirements for "lead-free" plumbing as defined by California, Vermont, Maryland, and Louisiana state laws and the U.S. Safe Drinking Water Act. 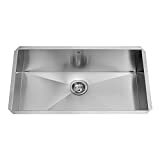 Why is stainless steel the recommended sink for outdoor kitchens? Affordable: High-end stainless steel options are really no different to its lower priced counterparts. 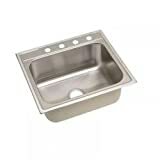 You can get high quality 16-18 gauge sinks that are quiet and thick enough to hold heavy items at a fraction of a price. 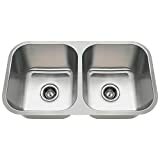 Durable: Stainless steel sinks won’t crack, chip, fade, or stain with proper care. Rustproof: Stainless steel metal has corrosion resistance and it gives out a nice glow. For your sink to continually have that nice sheen you should take care of it. Maintaining it is easy; you don’t need harsh chemical substances to clean it. Only a simple household cleanser and tower will do. Longevity and recyclability: Stainless steel is proven to give optimal performance for years. It may also be recycled as it doesn’t degrade or lose any of its properties in the recycling process. It’s a good green option. You don’t have to spend too much when buying your outdoor kitchen sink because there are tons of choices in the market that promises longevity and top performance. Although some models come cheap, it doesn’t mean that they won’t function well, especially if you have picked a stainless steel one. Just make it a point to try and care and protect for your sink, especially since it is installed outdoors, under the harsh weathers. Sinks that are not maintained and cared for, no matter how cheap or expensive, will not last.